This invaluable guide provides comprehensive profiles of more than one hundred hot new businesses that promise the top opportunities for small-business people in the future. The Inside Information You Need to Know to Select a Home-Based Business That's Right for You! The Inside Information You Need to Know to Select a Home-Based Business That's Right for You! Based on the top-selling Best Home Businesses for the 90s, this is a completely updated, comprehensive look at the leading businesses for small and home-based entrepreneurs in the 21st century. This guide is a proven helpful compendium of business opportunities suited for those who want to work from home. An introductory section explains the requirements for operating a home-based business. Then each of the profiles outlines what the business entails, contrasts its advantages and disadvantages, lays out specific steps to get started, and suggests ways to identify and attract customers. Trade associations, professional organizations, books, seminars, and Web sites for each business are also included. 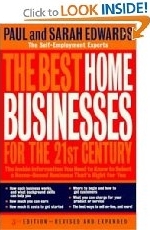 The Best Home Businesses for the 21st Century provides comprehensive profiles of more than one hundred hot new businesses that promise to be the top opportunities for small-business people in the future. This book's greatest asset is the specific estimates for start-up costs and recommendations on how to price products and services.